Engage your audience in most powerful ways using storytelling.Close your audience by telling stories like they are your friends and family. Creating telling stories has some features, let talk about characteristic for telling a story should be simple. More stories familiar feel that more powerful. Identify more people with the story m the more likely persuade. Dramatic development and emotional dynamic for telling stores.Hand by hand between characters and conversation of the story. The more readers put themselves into the story, more likely to change opinions. Now, How to create engage contents with telling stories? Create articles with one image every 75 to 100 words to be sharable. Use bullet points or numbers with tips and list to emphasize. Bold keywords that very important to draw attention. Write short phrases those stop lost the meaning. Use subheadings to section your articles to several parts. White spaces between paragraphs will set a good impression. Write title headlines to make it more and great reading articles. 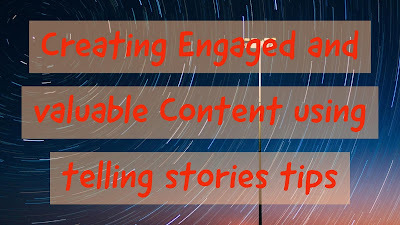 Provide content that has useful and valuable to the readers with trusted sources. Thanks for watching our videos on tech express channel and I'm happy if subscribe, like, comment and share the video.